There are a few ways you can identify solid masonry from brick veneer, both of which may or may not be examples of quality Toronto masonry work. While masonry buildings are very popular in Toronto, not all brick buildings are made entirely of brick. In fact, there are two different types of brick buildings: solid brick and double brick, also known as solid masonry or brick veneer. 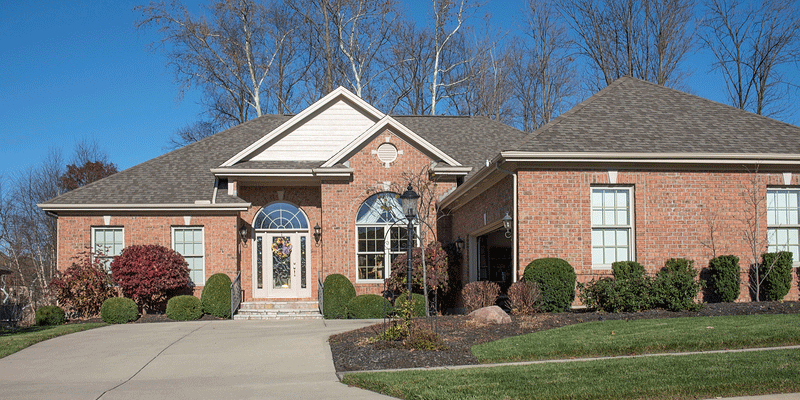 The majority of newer homes are built with brick veneer. Brick veneer homes are still made out of bricks, but the bricks are only one wythe thick. Behind the brick façade is a wood frame wall responsible for holding up the house. The brick veneer acts as decorative siding. Since no one ever sees the interior wythe, it is not uncommon for a substitute material such as concrete or cinder block to be used instead of bricks. Brick veneer became more popular after building codes made it a requirement to include insulation in exterior walls. The best type of insulation is light and fluffy so that it can trap air, but brick is anything but light and fluffy, meaning it’s a poor insulator. A brick veneer home has space between the wood frame and the exterior brick where insulation is added. The interior walls and frame are often built and filled in with sheathing and insulation before the brick is ever put into place. When the brick is installed, metal ties are nailed into the wood frame, and should be nailed into studs as opposed to just the sheathing. Metal ties are then bent so that they sit horizontal after being imbedded in the mortar joints when the brick veneer wall is installed. Brick veneer is added to the outer edge of the foundation wall, granting one-inch of air space between the sheathing and brick veneer. Solid masonry construction means only bricks are used to hold up the entire house. The two layers of wythe are both made of bricks, both the façade and the inner frame. Two comparable brick houses could be made entirely different, one made of solid brick and the other brick veneer. Traditional solid masonry walls include an outer layer of brick as well as an inner layer of brick, technically known as wythe. If the inner wythe is not made of brick it is considered brick veneer. On the other hand, if the inner wythe is made of bricks it is considered to be solid masonry. The taller a building is, the greater the risk that a building’s wythe will separate from the outer wythe. Header bricks are used to hold the two wythes together, about once every 6 rows. Looking at the outside of your home, you’ll be able to identify these header bricks because they are shorter than regular bricks. While they are really the same size, they are placed sideways in the wall so that all you see is the head of the brick from the exterior of the building. Sideways bricks play bridge between the inner and outer wythe, preventing the two from separating. There are a number of different patterns commonly used, for instance some header bricks are placed at the end of the wall every 6 rows, and in other cases every brick in the course is a header brick. You may also see two short bricks followed by two long bricks, and so forth. Long bricks are called stretchers and short bricks are called headers. Bricks installed above windows with their long face parallel to the wall are called soldiers. If bricks all face the same direction, known as a running bond or stretcher bond, it is likely that they are placed around a wood frame. But… if your home has metal ties holding the two wythes together, no header bricks are visible. This makes it super easy to confuse a solid masonry wall from a brick veneer wall. Move outlet covers and check behind your electrical box. If you see an open void, you know it’s a wood-framed wall. On the other hand, if the area around the electrical box is solid, you likely have bricks holding up the frame of your home. Which Is Sturdier, Solid Masonry Or Brick Veneer? When properly constructed, solid masonry walls are stronger than brick veneer but brick veneer offers about as much strength as you’ll likely ever need, as well as better insulation. The differences between the two types should not influence your decision to buy a particular house. Instead, the overall condition of the masonry work is much more important.